1. Insect and locate where the cockroaches might be nesting and the area which most of the infestation originates. 2. Identify what species of cockroach it is and apply the appropriate control measure. 3. Treat the nest and or surfaces where cockroaches are active with a spray or dust. 4. If cockroaches are present in the kitchen a cockroach gel bait can be applied to cupboard hinges, behind fridge, around oven and dishwasher, under jug and microwave, around hot water heater, etc. 5. Cockroach traps can be installed under furniture, in the back of cupboards, under fridge, inside store rooms, etc. 6. Eliminate food particles by vacuuming and use other methods of hygiene both inside and outside the house or commercial premises. Cockroaches are the most common pests of houses and restaurants throughout Australia. Over the years certain species have co-habited with humans in many areas such as homes, ships, food production and storage facilities. Some species of cockroaches like to live in sewer systems, drains and compost heaps. Cockroaches that have come into contact with animal and human faeces as well as contaminated food will transfer these organisms on their bodies and their faeces to food which is being prepared for human consumption. Human diseases have been found in and on the bodies of cockroaches. These include diseases such as gastroenteritis, dysentery, hepatitis, tuberculosis and organisms which cause food poisoning. Cockroaches eat a wide range of foods, which means most domestic situations are attractive to them. Attractants like crumbs, dried liquids on carpets, hair and starchy bindings of books ensure their survival. While some cockroaches can fly, the most common dispersal occurs through the transportation of food, food cartons and other goods. Cockroach eggs are covered in a purse-like egg which depending on the species contains 12 – 40 eggs. The egg cases are either dropped in areas where the cockroach is active or sometimes in some cases they are glued to surfaces. Cockroaches hatch as nymphs. They grow through several ‘moults’ in which they shed their cuticles, until they are adults. Cockroaches have not resting stage and the nymphs wings also gradually develop at each moult until they are fully winged adults. Some cockroaches reach maturity within 3 – 4 months, while others require about 12 months. Depending on the species their life span varies from 2 to 12 months and in that time can produce anywhere from 5-30 eggs. Cockroaches consume a wide range of foods returning to their hiding places during the day, usually in cracks, crevices and in sometimes in furniture. It is important that computers and microwaves be protected as some cockroaches like to nest in these warm pieces of equipment, often resulting in expensive repairs to the electronic components. Cockroaches are nocturnal, hence why you will only see them of an evening. Usually you do not realise the magnitude of a problem unless the cockroach activity is viewed during the night, sites of infestation can contain hundreds of both developing and mature cockroaches. Cockroaches groom themselves by passing their antennae and legs through their mouthparts. This practice has been exploited in the application of some chemicals used in their control. In Australia we have over 400 native species of cockroaches. There are 6 pest species, which apparently originate from tropical and subtropical Africa and now occur over most of the world. Cockroaches where introduced to Australia 200 years ago and are now the most common household pest. These are one of the smaller cockroaches, amber brown in colour and with two long dark stripes on the thorax. They are the most prolific breeders of the cockroach species, having 3 – 4 generations a year with them only taking 40 days to mature during summer. German cockroaches are most commonly found in kitchens behind and under stoves, fridges, dishwashers, microwaves and sinks. In some cases they have been attracted to the warmth of computers and have had their electronic controls damaged because of this. When German cockroaches are seen in rooms other than the kitchen, it is likely that the population is very dense throughout the building. The American adult cockroach is typically 35-40mm long with pale yellow border around the upper area of the thorax. These cockroaches can fly. A female can lay up to 50 egg cases, each containing 10-25 eggs. The eggs are often glued to surfaces near food. From egg to adult takes around 6-12 months, and the adult can live for at least 6 months. These cockroaches live indoors and outdoors depending on the conditions. They like to live in wall cavities, roofing and subfloors located near drains and sewers, which potentially mean they could spread disease. The Australian adult cockroach is 30-35mm long. It has a dark body with pale yellow areas on the upper area of the thorax and on the margins of the front wings. A female can lay up to 20 egg cases, each containing 20-24 eggs during their lifetime. These cockroaches prefer warmer climates and are found mostly outdoors in plants, wood piles and under garden litter. They can also be found in roof voids and walls. These are a smaller cockroach, around 10-14mm long. Males have full wings and females have short wings. They have pale bands across both the thorax and abdomen. There egg cases contain up to 18 eggs and are usually glued to a surface. They have a short development period of 2 -4 months and live for about 6 months. Brownbanded cockroaches are commonly found indoors where they occupy wardrobes, offices, hospitals and restaurants. This large cockroach is usually dark brown in colour, measures 30-35mm long. The adults can live for 6-12 months and are capable of flying. Females can lay up to 20 egg cases each containing 26 eggs. This species is often found in roof voids, walls and subfloors. They enter houses via garden areas and greenhouses where plant materials form much of their food. They are not often found in kitchens or other rooms of the house. The Oriental cockroach is medium in size and dark brown in colour. Usually 20-25mm long, with reduced wings in both the male and female. A female may produce 8-14 egg cases each containing 12-18 eggs. The Oriental is found in cooler climates usually under litter and garden mulch. Also can be found in garbage disposal areas and damp places such as cellars, subfloors and walls. The reduction of population is achieved by the implementation of sanitation and hygiene as well as by the application of chemicals. Both these methods should complement each other. Like most animals cockroaches need food, water and shelter. These three requirements are present in most houses and buildings where humans live and work. 1. Remove all food and water sources at the end of each day so it is not available at night. 2. Ensure food is stored and sealed in containers and in the fridge to reduce accessibility. 3. Keep garbage waste sealed in containers prior to collection. 4. Inspect incoming containers from food stores prior to opening in the house or business. 5. Steam appropriate food articles in microwave to kill eggs before storage in kitchen. 6. Regularly inspect motors of fridges, washing machines and behind stoves as these provide shelter and warmth. 7. Monitor microwaves and computers, these provide shelter and warmth, particularly in winter. And may help to avoid expensive repairs. 8. Use vacuum cleaners to remove food waste from floors and cupboards in kitchens. Wiping may leave residues in cracks. 9. To prevent cockroach access fill in cracks and crevices in walls and cupboards. 10. Inspect roof cavities as this can often locate populations of somky-brown and American cockroaches. An inspection of the entire property including the roof cavity, subfloor and the garden area should take place prior to and chemical application. During recent years a group of insecticides know as ‘insect growth regulators’ (IGR’s) have been developed and these are effective against most species of cockroach. These pesticides disrupt the normal function of the insects to cause death. There are two types of IGR: juvenile hormone analogues which disrupt the normal development of cockroaches; and chitin synthesis inhibitors which disrupt the normal formation of the cuticle causing death during moulting as the cockroach cannot replace its shed cuticle. Using this form of control may take 3 – 5 months to take effect after application so it may be necessary to add a traditional insecticide such as permethrin to kill the adults while the IGR is taking affect. IGRs have a very low toxicity to humans, but have a long term effect on the cockroach populations. Dusts containing boric acid are also available and are applied directly to cracks and crevices. The dusts are oral poisons and are ingested during grooming by the cockroach. Chemical baits have also proved effective in controlling cockroaches, in particular German cockroaches. 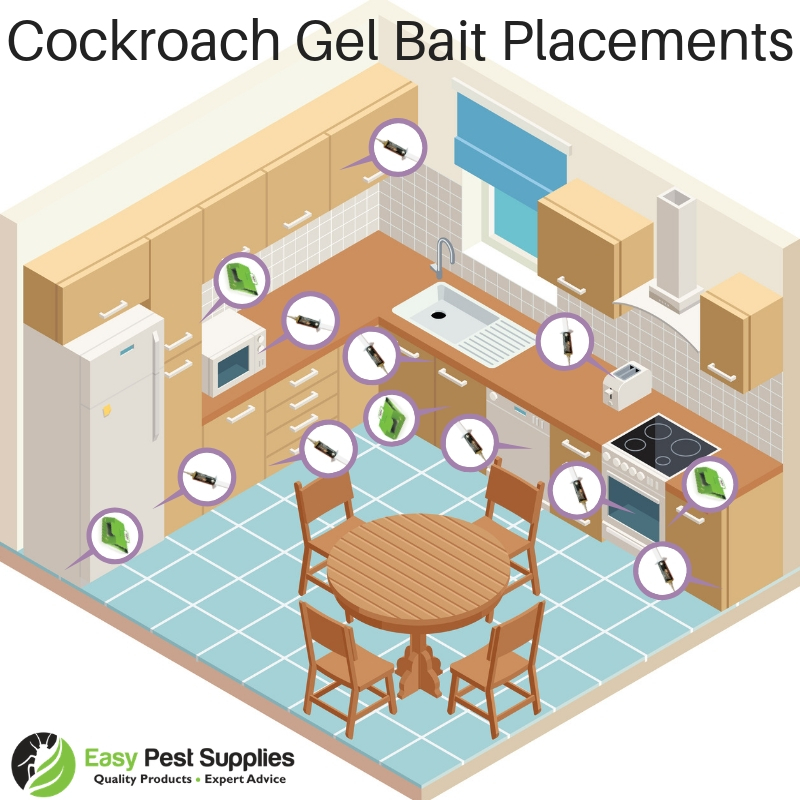 Baits come in the form of gels and can be placed in areas like behind fridges, dishwashers, microwaves, under kettles and near computers. Baits should be checked and changed regularly. While most insecticides are effective for some months the growth regulators and baits complement these sprays giving long term control. Cockroach traps may also be used but do not give adequate control on their own. The most favoured areas for cockroaches are kitchens, bathrooms and roof cavities. Special attention should be given to areas surrounding dishwashers, fridges, microwaves and stoves. The best time for application is night time just after dinner as this is when the cockroaches are most active.